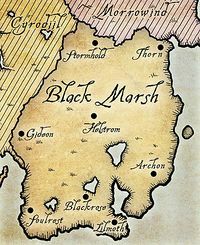 Blackrose is one of the eight-major cities in the province of Black Marsh, situated near the legendary site of Murkwood, the dark forest that ever moves. Blackrose is found near the center of Black Marsh, and it is only a day's march away north from the infamous Blackrose Prison, which is located in the region of Murkmire. Blackrose, along with the rest of southern Black Marsh, was once the territory of the Lilmothiit, a race of vulpine Beastfolk. In fact, modern-day Blackrose was built from the remains of the ancient Lilmothiit settlement. The riverways of Black Marsh are known to intertwine with each other, as seen when it is possible to take a river route from Soulrest, to the Blackrose region. All the while, not only does Blackrose show signs of Argonian occupation, but there is Imperial architecture, much like the rest of southern Black Marsh, from Gideon to Murkmire. Near the city-state is the legendary forest of Murkwood. Blackrose is neighbored by several settlements, including Longmont in the southwest, and Rockspring in the northwest. The original Blackrose was founded by the Lilmothiit, a nomadic race of beastfolk that lived throughout the southern coast. In 1E 1033, the infamous Argonian brigadier, Red Bramman, was active at the time, and had a powerful bandit kingdom near what is now known as Blackrose. Empress Hestra of the First Empire had placed a significant bounty on Red Bramman, demanding his head. The Imperial Fleet had tracked Red Bramman across Black Marsh, and into his brigand kingdom, successfully killing Red Bramman and ending his reign. This was the first reliable source of the true Black Marsh culture for outsiders. At one point or the other, the Lilmothiit Blackrose had fallen into disrepair, along with the Lilmothiit race, who were wiped out by the Knahaten Flu in 2E 560. Eventually, the Argonians took control of Blackrose. The Imperials would come into Blackrose later. It had also garnered an infamous reputation. The ruins of the old settlement would become the foundation of Blackrose Prison, an infamous prison that was created in a single day by Pelladil Direnni, by the orders of Versidue-Shaie, during the latter half of the Second Empire. It was built by summoning an army of Stone Atronachs. During the reign of Morihatha Septim in the Third Era, the city-state of Blackrose was a city of the Third Empire. There was a rebellion against the Empress in Blackrose, that was dealt with by her Imperial Battlemage, Welloc. Welloc had utilized a Vampiric Cloud. The circumstances is considered a prime example of the School of Destruction. Using the Vampiric Cloud, Welloc had transferred the rebellion's abilities into their opponents, quelling them in the process. During the Imperial Simulacrum in the late Third Era, Blackrose was an active settlement, being ruled by King Claudios. It had a rivalry with Lilmoth. For game-specific information, see the Arena article. This page was last modified on 11 February 2019, at 05:13.